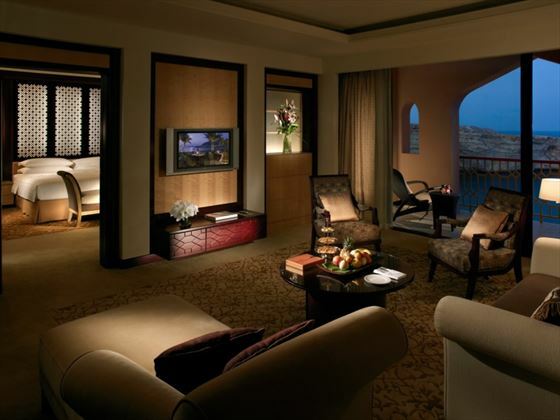 Shangri-La Al Husn Resort & Spa, Oman. Book at Tropical Sky. Perched on a cliff overlooking the Gulf of Oman against a dramatic backdrop of rugged mountains sits Shangri-La Al Husn Resort & Spa. 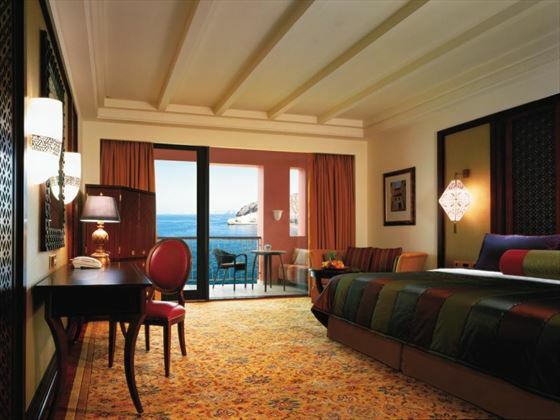 With décor inspired by lavish Arabian palaces, indulgent facilities and restaurants, and some of the largest rooms and suites in Oman, Al Husn is a regal oasis that is perfect for a luxury getaway. You’ll be sure to feel like royalty at this striking hotel. 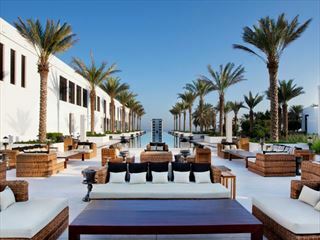 Guests of Al Husn have access to a spectacular exclusive beach, with gorgeous views and a peaceful ambience, and a private infinity pool and bar to relax and sip cocktails. You’ll even be treated to a complimentary mini bar replenished once a day, daily afternoon tea, as well as complimentary pre-dinner cocktails and canapes to tuck in to. If that’s not enough, the hotel is home to two fine-dining restaurants and close to the fantastic, adult-only CHI, The Spa with its holistic treatments and revitalising facilities. WiFi is available throughout the resort, as well as a wide range of restaurants, water sports, spa treatments, and deluxe, ocean view suites. Journey to this exclusive castle and delve into pure luxury. Al Husn accepts children over the age of 12 years & the pool & beach facilities are available to children 16 years and above ONLY. 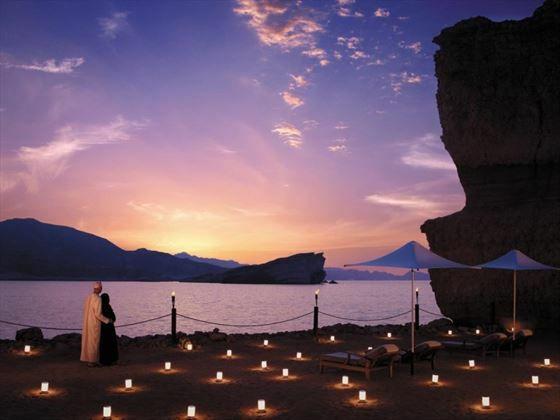 Shangri-La Al Husn Resort & Spa is nestled within 124 acres of white sand beach and fiery mountains in Oman. 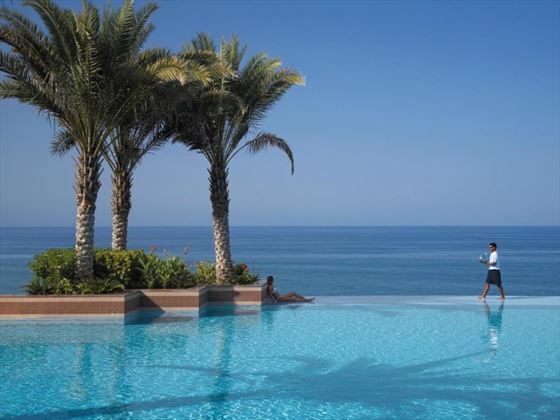 Located along the beautiful bay of Barr Al Jissah, the hotel has spectacular views of the Gulf of Oman and miles of sand to sink your toes in. 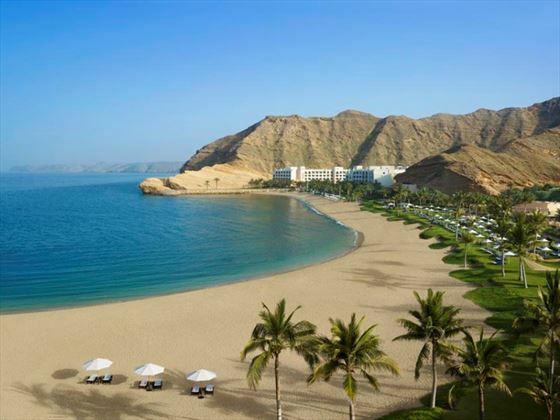 Oman’s vibrant capital, Muscat, is only a 30 minute drive from the resort, offering stunning, ornate buildings and a rugged cliffs that loom over the bustling Muscat Harbour. To delve into Oman’s beautiful culture, head to Mutrah Souk, a lively hub of markets selling gorgeous jewellery, arts and crafts, only a 20 minute drive away. Al Husn has daily complimentary shuttle buses for Mutrah. 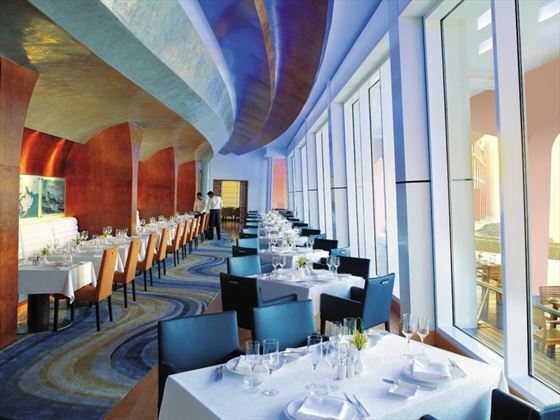 Al Husn holds two fine-dining restaurants, and Al Husn guests have access to all of the eateries in the resort. Sultanah – A stylish dining experience with décor inspired by a luxury cruise liner. 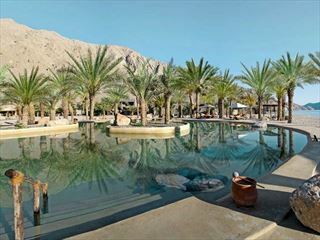 Located at Al Husn, and restricted to guests over 12 years old. Open 6.30pm – 11pm. Smart casual dress code. 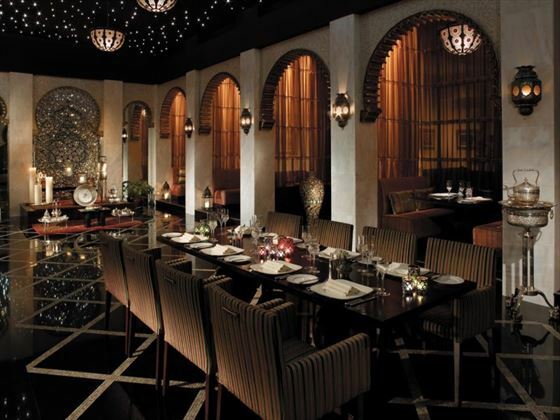 Shahrazad – Exquisite Moroccan cuisine and lavish interiors. 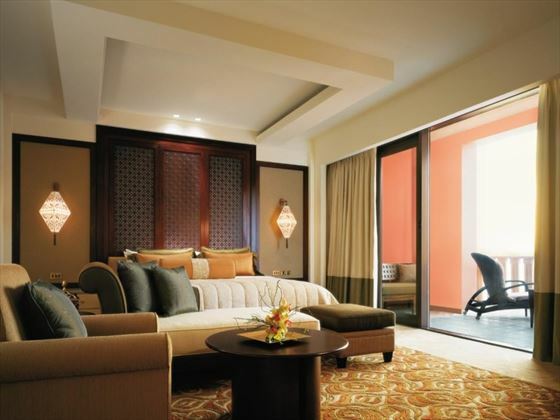 Located at Al Husn and estricted to guests over 12 years old. Open 7pm-11.30pm. Smart casual dress code. Mahhara Beach Bar – Exclusive to Al Husn, with fresh cocktails and a private, adjoining beach area. Open 10am – 7pm, with food available between 12pm – 4pm. Al Tanoor – Traditional Arabian cuisine and Arabian tent interior. Located at Al Bandar and open 6.30am – 11am, 12pm - 3pm and 6.30pm - 11pm. Smart casual dress code. Asia – East and southwest Asian inspired cuisines with glass-enclosed show kitchens. Located at The Heritage Village and open Tuesday to Sunday 5pm – 11pm. Resort casual dress code. 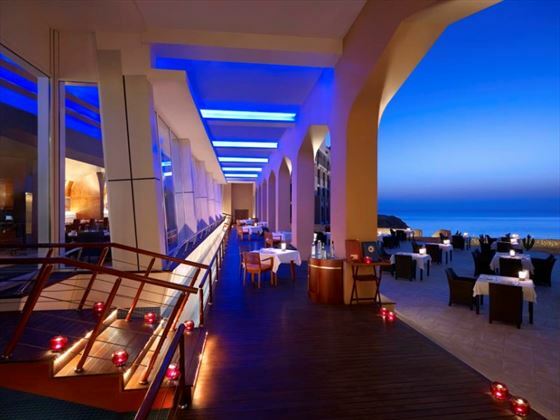 Bait Al Bahr – Tuck in to authentic Omani cuisine including fresh seafood. Located between Al Waha and Al Bandar hotels. Open 7pm – 11.30pm with a resort casual dress code. Capri Court – Contemporary Italian cuisine with a trendy ambience. Located at Al Bandar and open 7pm – 11.30pm. Resort casual dress code. Fairouz – Inspired by the legendary Lebanese singer Fairouz, with a mix of hot and cold mezze and grills. Located at The Heritage Village and open Tuesday to Saturday 6.30pm – 1am. Smart casual dress code. Samba – Exotic international cuisine with open show kitchens. Located at Al Waha and open 6.30am – 11am, 12.30pm – 3pm and 6.30pm – 11pm. Resort casual dress code. Surf Café – A family friendly café with healthy salads, snacks and internet stations. Located at Al Waha and open 11am – 10pm. Casual dress code. Tapas & Sablah – A relaxing piazza serving Mediterranean and Asian tapas. Located at Al Bandar and open 6pm – 1am. Casual dress code. Zafran Café – Casual café close to the shopping arcade and children’s facilities. Located at The Heritage Village and open 11am – 7pm. Casual dress code. Circles Pool Bar – A casual bar next to the Al Bandar pool. Open 10am – 7pm, with food available between 12pm – 4pm. Assira Pool Bar – A laidback bar next to the Al Waha pool. 10am – 7pm, with food available between 12pm – 4pm. Al Husn Lobby Lounge – A classy, premier lounge with teas, pre-dinner cocktails and light snacks. Afternoon tea, pre-dinner drinks and canapes available to Al Husn guests only. Open 8am-12.30am with a smart casual dress code. 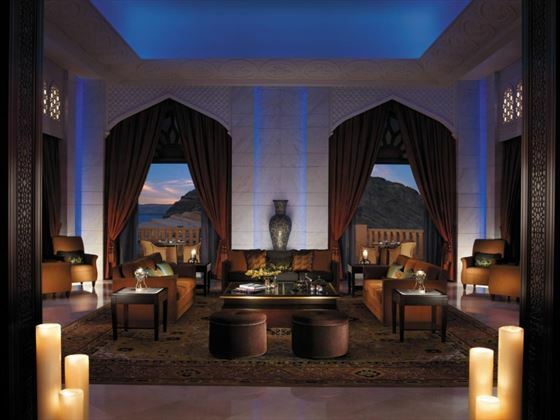 Piano Lounge – Overlooking the Sea of Oman with great cocktails and cognacs. Open 6pm-2am and located in Al Bandar. Smart casual dress code. The Long Bar – A trendy bar with signature cocktails. Located at Al Bandar and open 6pm – 2am, with a smart casual dress code. B.A.B Lounge – A cool rooftop bar with cocktails, wines, canapes and sharing platters. Restricted to guests over the age of 21 after 9pm. Open Saturday to Wednesday 5pm – 1am and Thursday to Friday 5pm – 2am, with happy hour at 5pm – 7.30pm. Guest of Al Husn have access to all swimming pools in the resort, including the Al Waha and Al Bandar pools, the Lazy River connecting them, and the private pool only available to those staying at Al Husn. All open 6am – 8pm. Bask in the sun at the resort’s private 1km stretch of private beach, featuring bathrooms, showers, beach loungers, towels and umbrellas for resort guests only. Complimentary non-motorised sports are also available here. Al Husn guests have access to a private 100 metre white sand beach, exclusive to Al Husn only. Only for those over the age of 16. The resort is also close to Turtle Beach, a small sandy cove at the edge of the mountains. 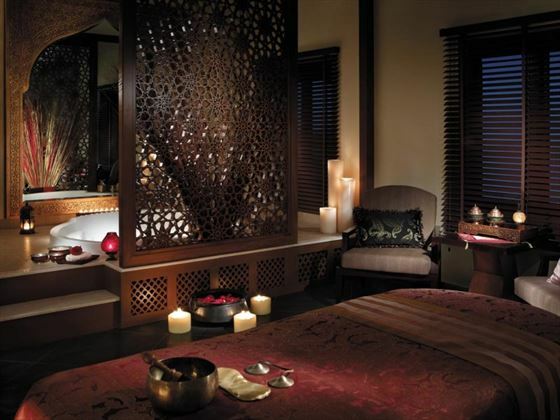 Rejuvenate your body and soul at the resort’s adult-only CHI, The Spa. There are plenty of contemporary facilities to try, including tropical showers, steam rooms and a hydro pool, as well as a wide variety of holistic treatments. Choose from Vitality Massages, refreshing facials, or light exercise classes to free and energise your body. Open from 10am to 10pm. Mini golf – A great nine hole course located in the Health Club, and guests can pick up complimentary golf putter and balls from the Health Club reception. Open 9am to 9pm. Water sports – The private 1km beach is home to plenty of thrilling water sports, including diving, snorkelling, and a banana boat. Non-motorised sports are complimentary, whilst motorised water sports have an additional charge. Fitness – Open from 6am to 10pm, this state-of-the-art gym offers plenty of fully-equipped cardiovascular and resistance machines. Treat yourself to some great facilities, including a sauna, steam room and Jacuzzi.